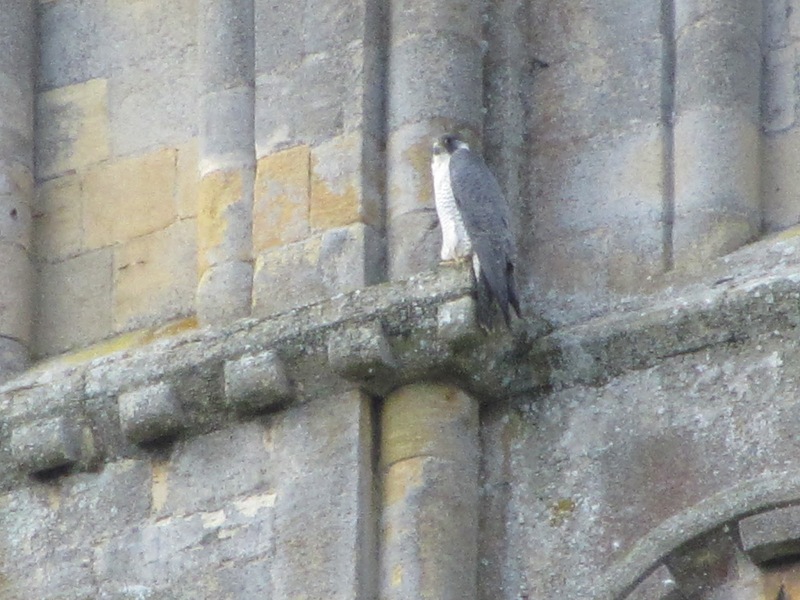 There's been a single peregrine visible on the tower of Tewkesbury Abbey since the winter of 2010/11. In the summer months it wasn't to be seen, but was spotted again the next winter, and I managed to get a couple of photos of it sitting on its favourite roosting ledge. 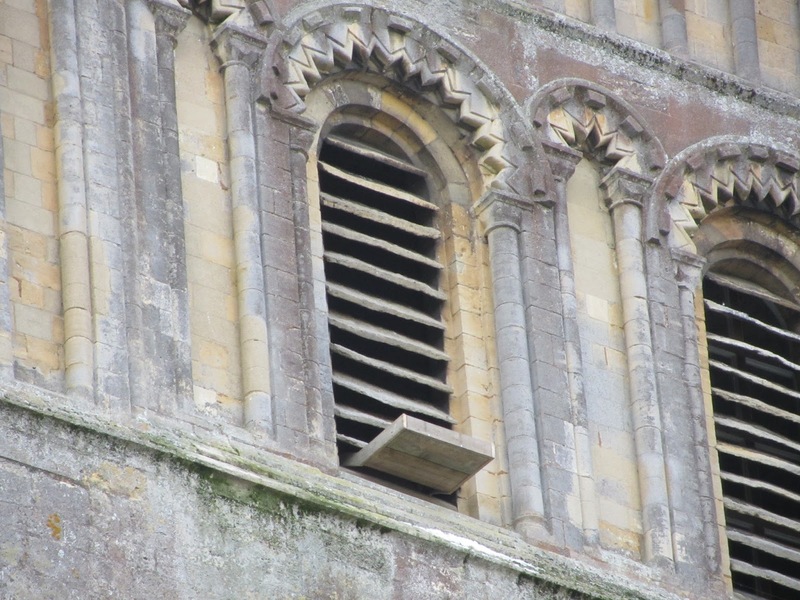 Hoping to encourage it to stay, I put a nesting platform up on the east side of the Abbey tower. This direction was chosen to be out of the prevailing winds, and shaded from the summer afternoon sunshine. The platform was made out of some spare planks and was covered with a layer of gravel. In early 2014, a pair of birds was first spotted, one larger than the other. 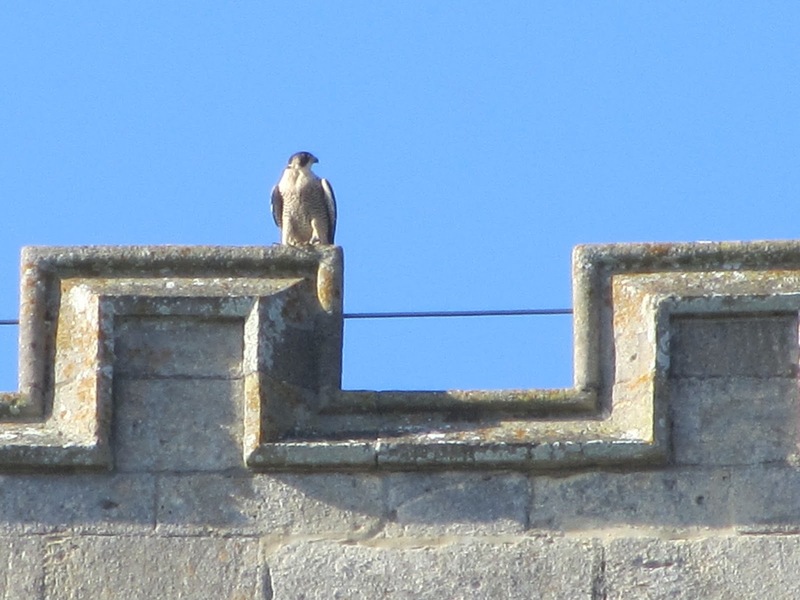 Here is the larger of the two sitting on the top of the tower. In September 2014, there were signs that the nesting tray was being used, since the gravel was disturbed and most of it was now missing. At this point, I put a video camera behind the louvres looking into it and crossed my fingers for some activity. 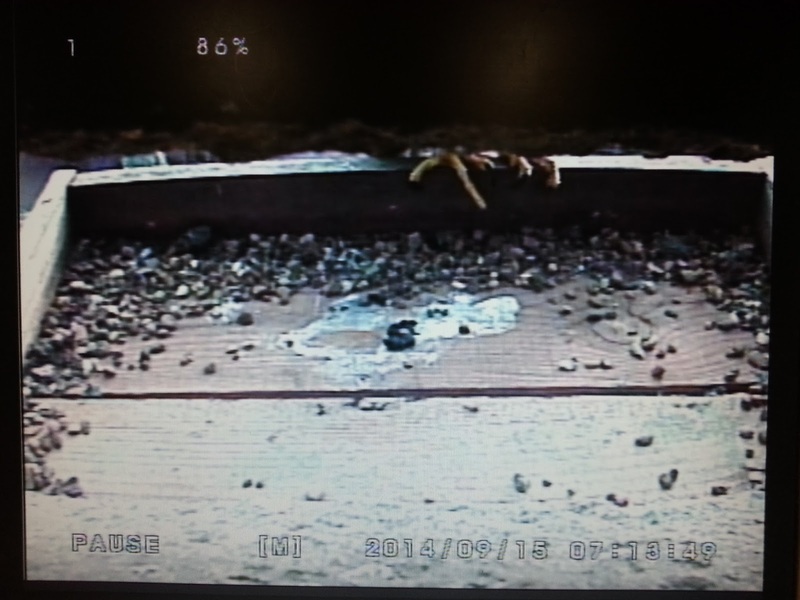 It shows one bird standing on the nesting tray looking at the camera. It is just possible to see that it has a ring, but the pictures were not good enough to read it. This was the next time the video recorder captured the presence of a bird. I quickly moved the camera a bit closer! 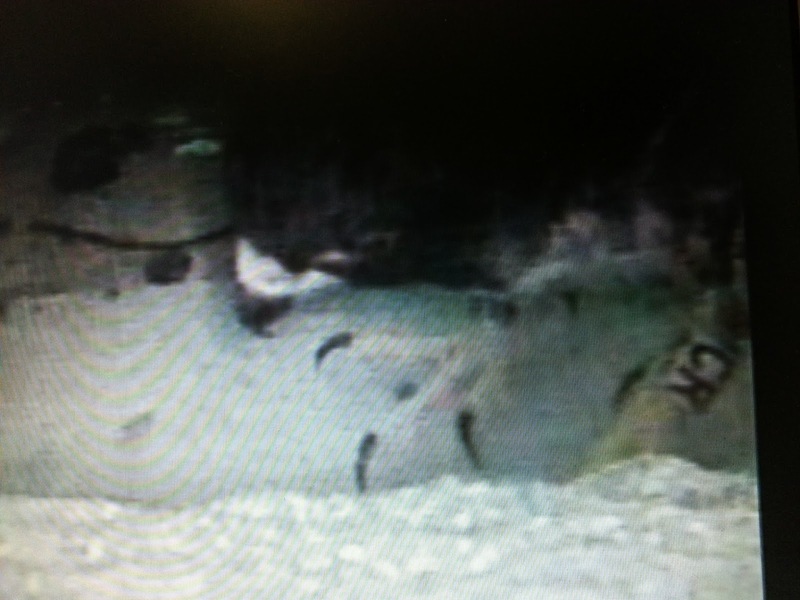 On playing back the video, I was very surprised to get this picture, clearly showing the "CR" on the left leg. An hour or so later, the camera had caught this image. This bird had a blue identification band, but frustratingly it wasn't possible to get a decent enough picture to read it clearly. From the moving pictures, it looked a bit like "XO", "XU" or something similar. 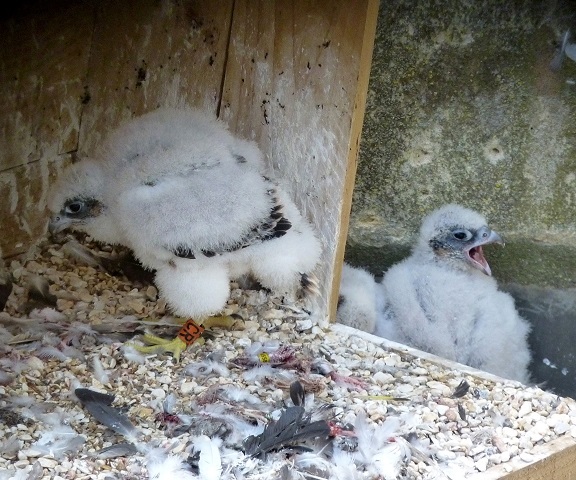 This is where the experts were needed, and I sent these pictures to Dave Pearce who manages the peregrine nest site at Christchurch in Cheltenham. He was delighted to confirm that "CR" was one of the birds which fledged in 2010 from Christchurch. 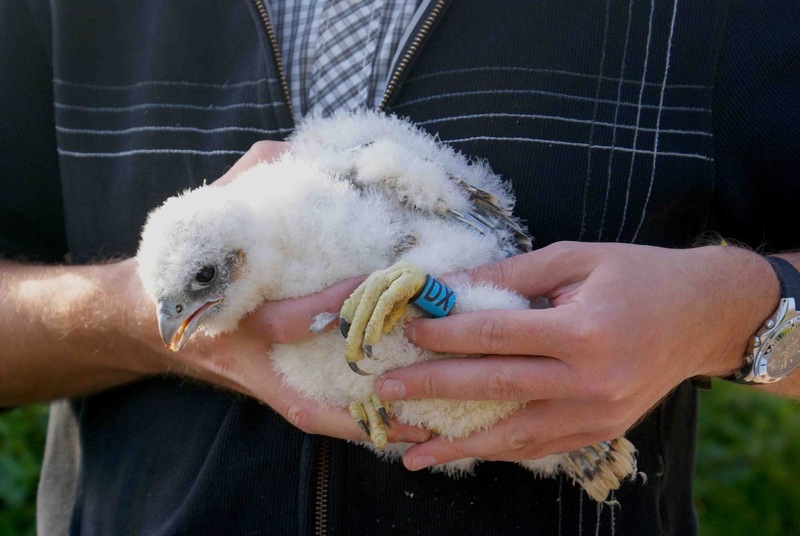 No less than 18 peregrines have fledged from this site since 2010, and CR (nicknamed "Christopher Robin") was one of three from 2010, and more importantly, is the first confirmed sighting of any one of these 18 birds. Here are a couple of photos of Christopher Robin on the top of Christchurch tower which Dave has kindly sent me. ... and a few weeks older. Dave's investigations into "XO" proved more of a problem, as these letters didn't tally with any known by him, or his other peregrine contacts, including Ed Drewitt. However in a moment of inspiration, Dave thought that "XO" might actually be "DX" and Ed confirmed this. 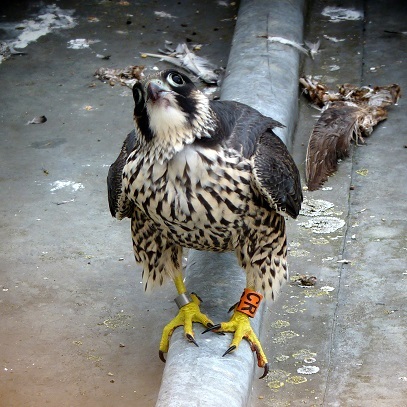 Here she is when she was ringed by Ed in the Avon gorge in 2012. If our male is called Christopher Robin, then the female ought to have another A.A.Milne name, so we chose "Alice", who you will remember that Christopher Robin went with to see the Changing of the Guard! That's the story of the Tewkesbury Abbey peregrines so far. I will keep these pages updated with any further developments. Tewkesbury Abbey is one of the most stunning churches in the country, and has been standing for nearly 1000 years. Now it is home to a couple of peregrine falcons, and this page will be updated from time to time with any news and photos of these magnificent birds. The one on the left is a male known as Christopher Robin (the letters on his leg band are "CR"). He fledged from Christchurch in Cheltenham in 2010. 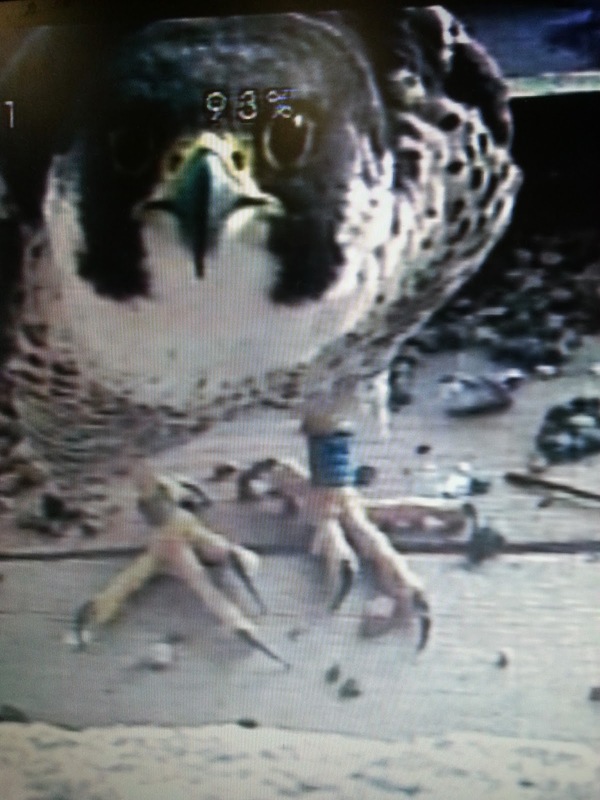 His lady friend has the letters "DX" on her leg, and she was ringed in the Avon gorge in 2012. We'd like to call her Alice! More details, photos and video to follow in due course!